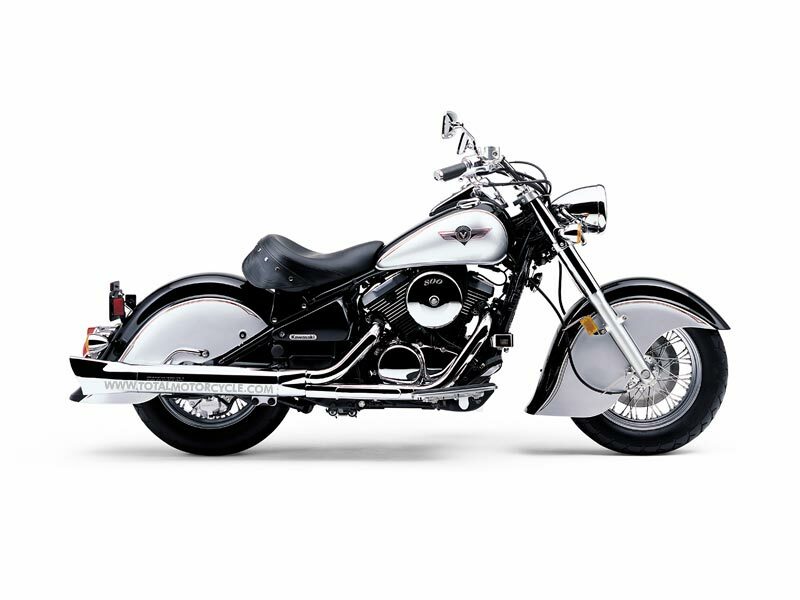 The Kawasaki Vulcan® 800 Drifter® cruiser has all the 1940s style and advanced features of the 1500 Drifter, but its smaller engine and lighter chassis make this middleweight Kawasaki perfect for those who are just getting started in the retro-cruiser lifestyle. Power for the Vulcan 800 Drifter comes from an 805cc V-twin SOHC four-stroke engine with a single-pin crankshaft for a classic V-twin rumble and gear driven balancer to reduce vibration. Finned cylinders and four-valve heads are liquid-cooled for optimum thermal control. Concealed automatic cam chain tensioners preserve the engine's clean lines and allow more precise cam timing, while a spin-on oil filter helps make maintenance a quick and easy job. The Drifter's 36mm carburetor features the Kawasaki Throttle Responsive Ignition Control (K-TRIC) throttle position censor, which is connected to the digitally mapped ignition system. K-TRIC varies ignition timing according to throttle position and engine rpm so that the ignition compensates for differing engine loads. The result is crisp throttle response and better fuel efficiency. For comfort, the Drifter's specially contoured solo saddle is nice and low, allowing the rider to comfortably plant both feet on the ground at stops. Wide floorboards allow for a relaxed sitting position, a heel-toe shifter makes changing gears in the five-speed transmission a snap, and self-canceling turn signals add to rider convenience. Finally, the generous use of chrome on the engine covers, bullet-shaped headlight shell, fork and shock covers, handlebar and clamp, rear fender rail, and license-plate bracket enhance the custom look. Upon its introduction in 1999, the Kawasaki Drifter motorcycle's styling was selected for permanent display in the Chicago Athenaeum: Museum of Architecture and Design collection. Placed on display at the museum's main building in downtown Chicago, it was declared "a work of art that goes beyond transportation. With its neo-retro style and esoteric performance technology, the Drifter embodies the essence of form and function."